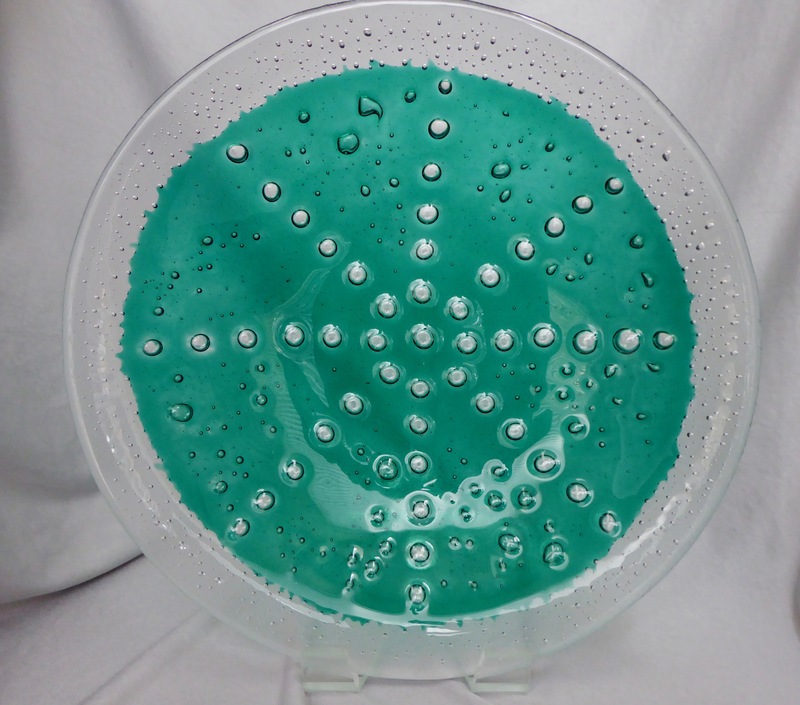 16 inch diameter bowl with wave motif on transparent sea blue background. Also available in 15 inch for $225, 14 inches for $210 and 12 inches for $190, as well as other blues and green, both transparent and opaque. Each is hand crafted and thus unique, and signed by artist Sandra Lercari. 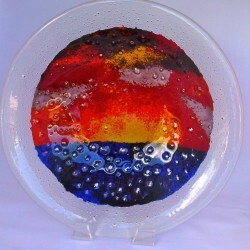 This 15 inch diameter bowl is constructed using pattern bars in red, white, and some blue. The bowl has a scalloped edge and looks very Southwest. Signed one of a kind piece by artist Sandra Lercari. 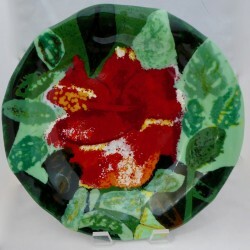 This piece is an 15 inch bowl with the Hawaiian Hula Girl hibiscus flower created using the Mosaic method. The marigold yellow hibiscus is on pie shaped wedges of 3 different metallic greens. This piece, being Mosaic, can be generally replicated. Since it is hand crafted, each bowl is unique. The glass is signed by the artist, Sandra Lercari. 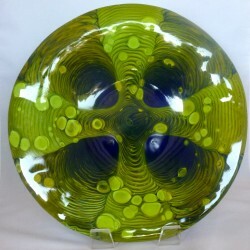 Wave motif combined with bubble technique to create 16 inch diameter bowl. Bowl is available in other background colors and sizes. Pieces are hand made and thus unique. Each one is signed by artist Sandra Lercari. Specify variation desired using "Contact Us". 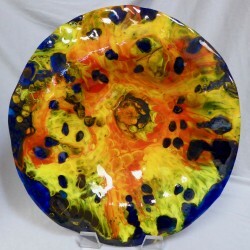 This is a 16 inch scalloped bowl created using violet and blue pattern bars integrated with marigold yellow and cyan blue. This is a one of a kind piece created and signed by artist Sandra Lercari. Sixteen inch drop pot bowl in black, blue, and white. This is a signed one of a kind piece by artist Sandra Lercari. 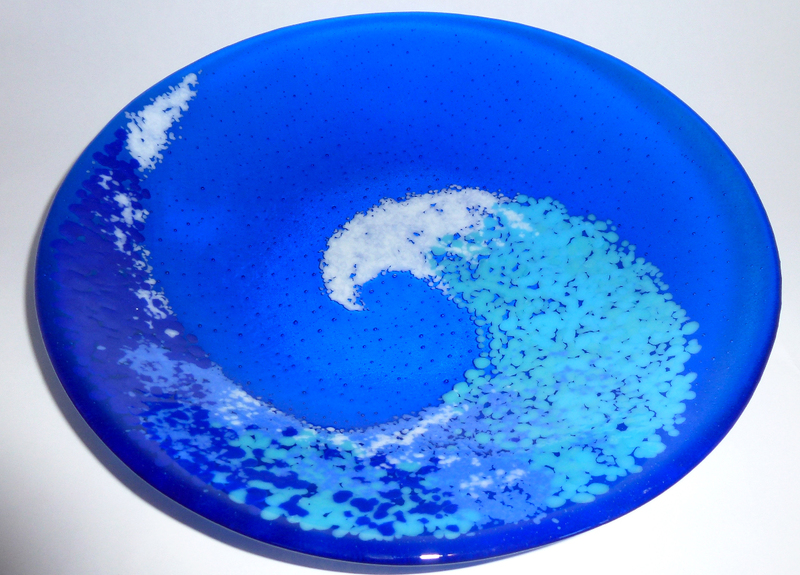 Fourteen inch transparent turquoise blue bowl with three waves. Piece created and signed by artist Sandra Lercari. 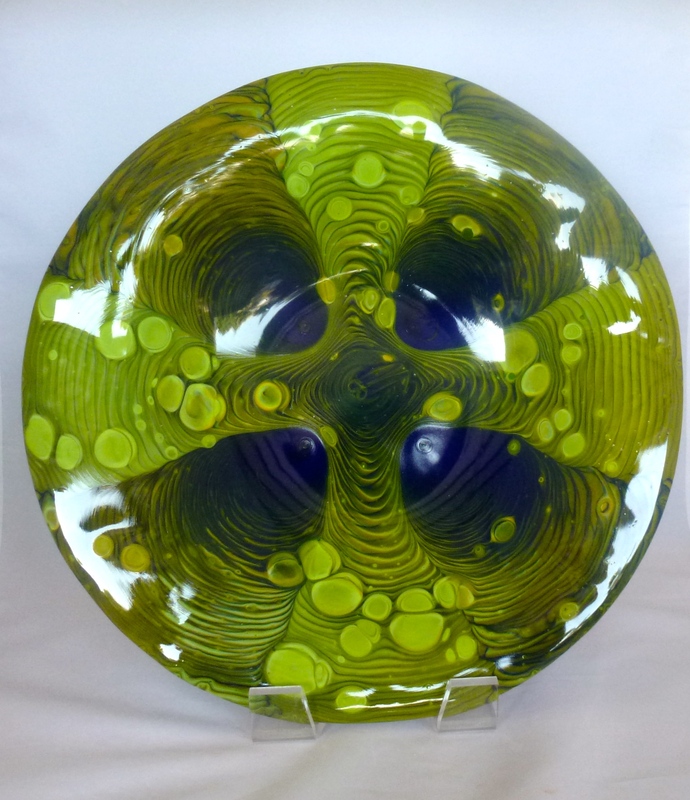 This is a one of a kind 17 inch bubble motif bowl created and signed by artist Sandra Lercari. The colors of the glass capture the beauty of the Maui Sunset. 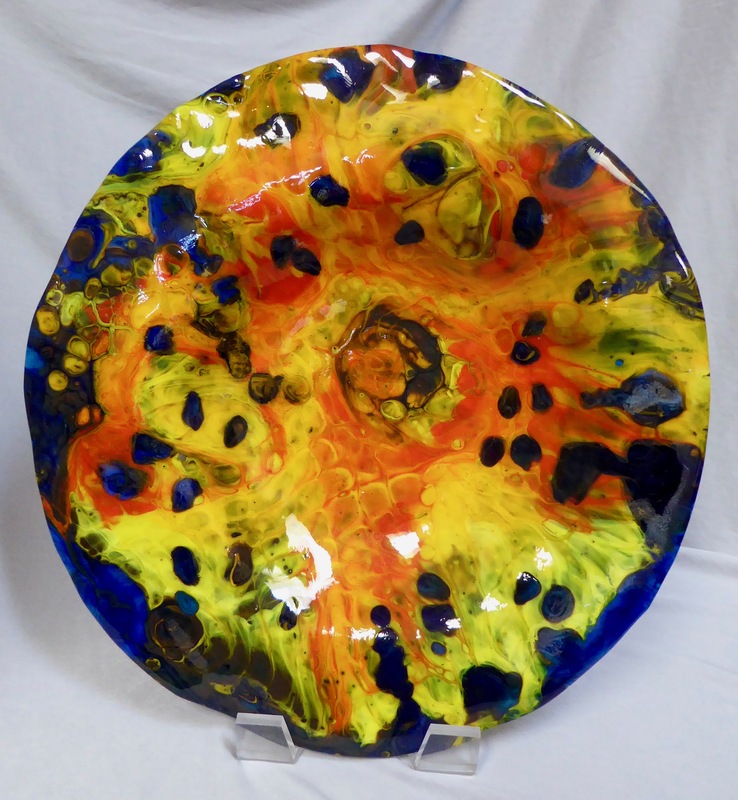 This 15 inch bowl has a base annulus in modeled opaque deep cobalt with an orange frit outer ring. The center is a four petal floral-like bloom using sparkly aventurine blue. The piece was created by artist Bob Lercari. Sixteen inch drop pot created using plum, lavender, and yellows by artist Sandy Lercari. The resultant coloring is like a beautiful watercolor. A deep red modeled annulus rimmed by marigold yellow frit surrounds a six petal floral spread. The center floral unfolds from reds through orange to yellow. The fifteen inch piece was created and signed by Bob Lercari. 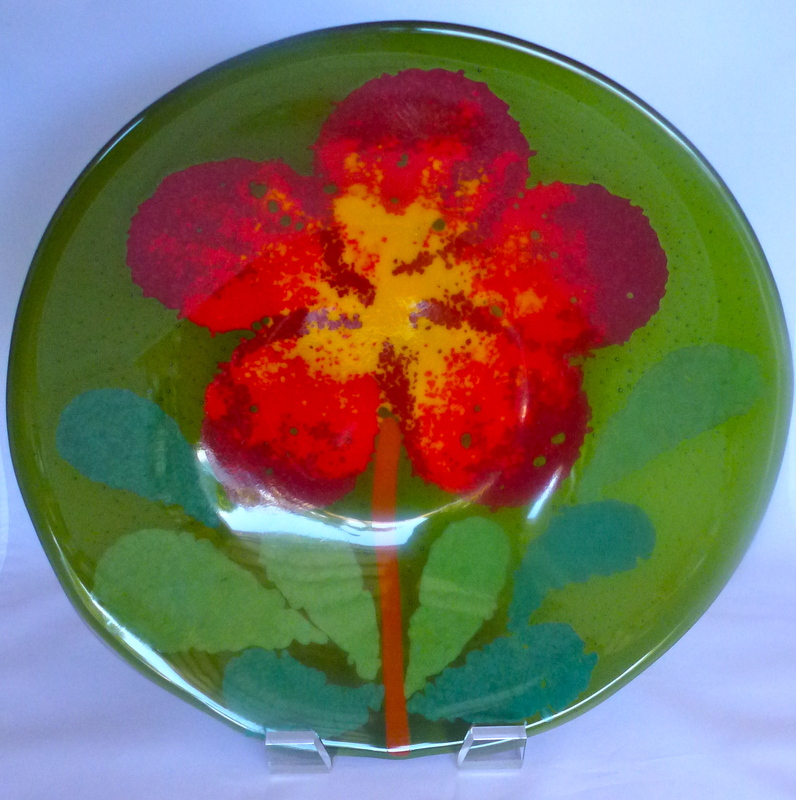 This sixteen inch bowl has a modeled forest green annulus surrounding a three petal tomato red floral pattern bar. Piece was created by artist Bob Lercari. Seventeen inch drop pot in subtle tortoise colors created by artist Sandy Lercari. 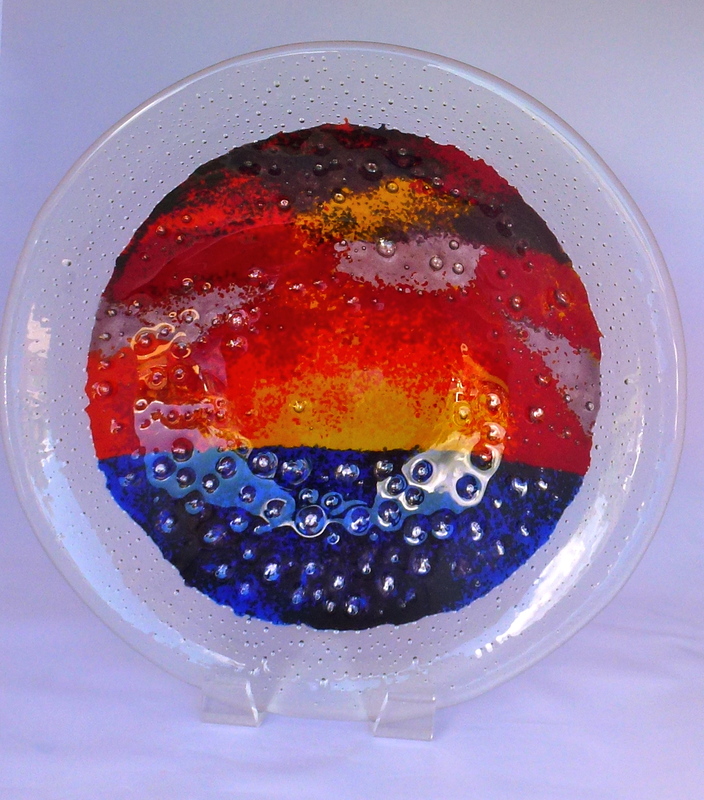 Fifteen inch bubble bowl with transparent purple center created by artist Sandy Lercari. A 15 inch drop pot with transparent blues and greens forms the base background on which a "Honu" was fused. 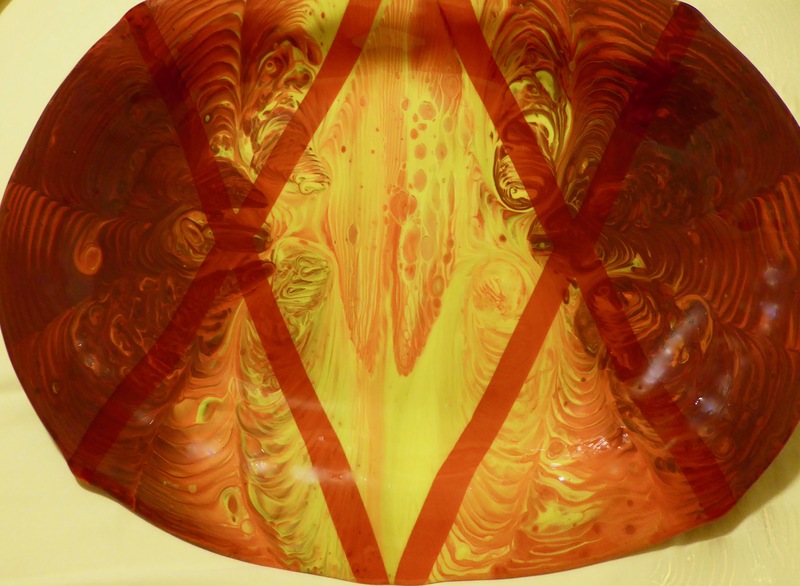 The bowl was created and signed by glass artist Bob Lercari. 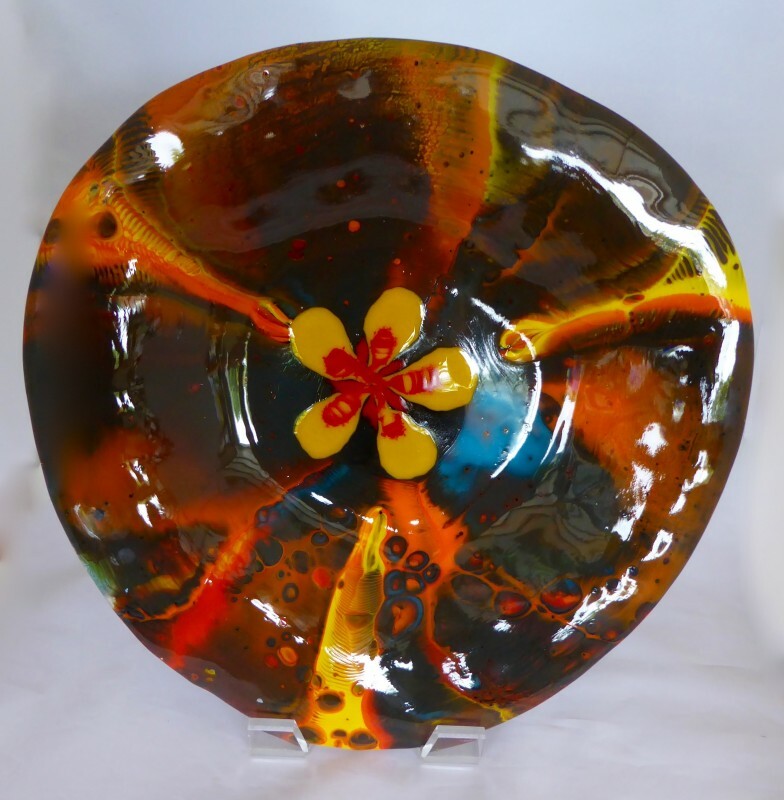 This is a 16 inch bowl with a floral design created by artist Sandra Lercari using frit (chips of glass) of red, orange, and marigold yellow. The flower and leaves appear to float above a translucent green background. 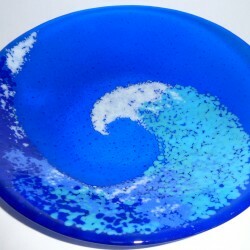 A 15 inch drop pot with transparent blues and greens forms the base background on which a wave motif was fused. 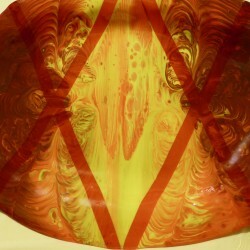 The bowl was created and signed by glass artist Sandra Lercari. 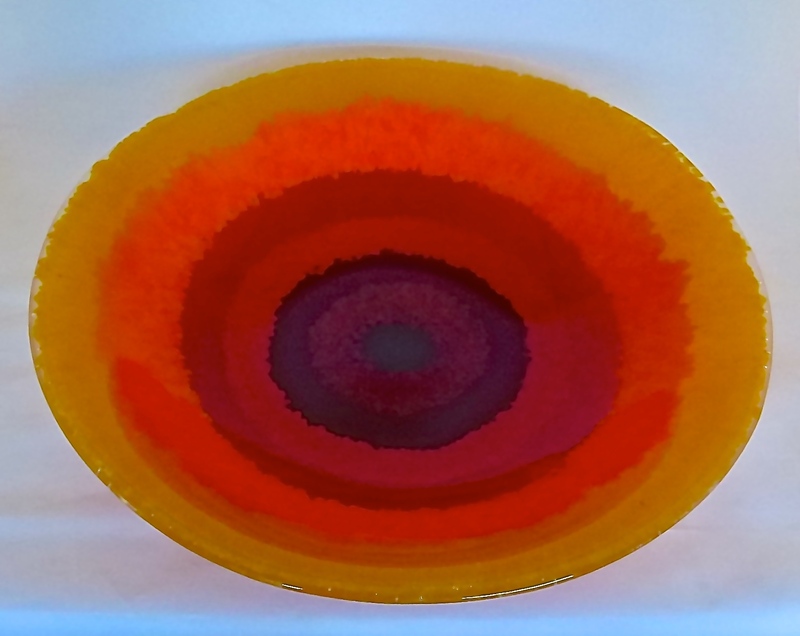 Artist Sandra Lercari created a 16 inch bowl with seven concentric rings of alternating transparent and opaque glass in oranges and reds. Fifteen inch drop pot in blues and white created by artist Bob Lercari. 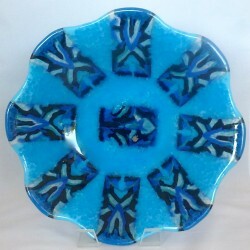 This is a 16 inch 7 ring mandala in blues of alternating transparent and opaque fused glass created by artist Sandra Lercari. Sandra crated a similar piece in reds and orange. 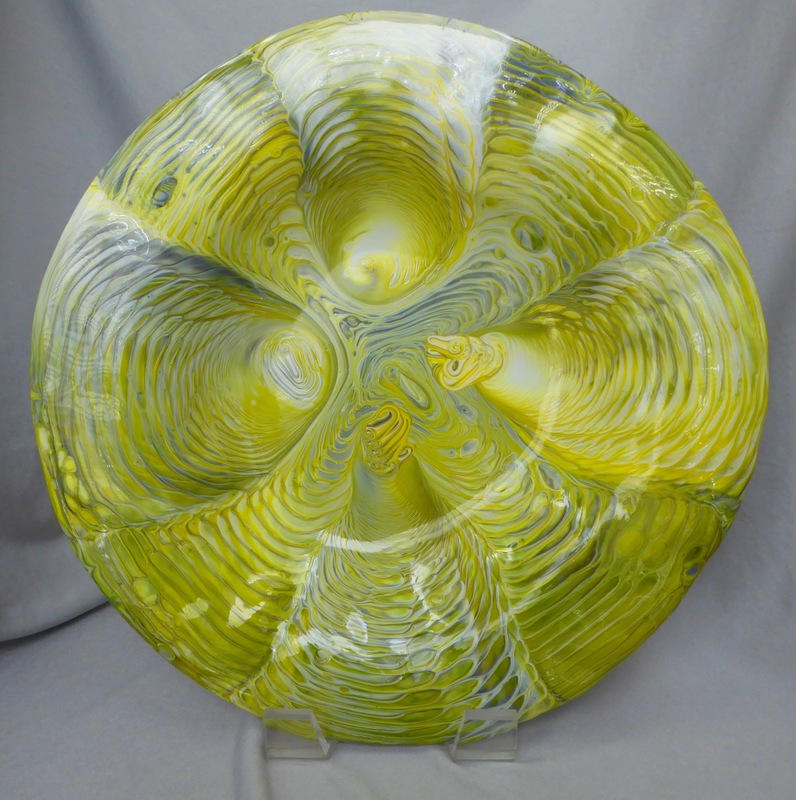 This sixteen inch mandala of concentric opaque glass rings starts with adventurine green on the outside followed by spring green, then orange, pumpkin, and marigold yellow in the middle. Piece was created and signed by artist Sandra Lercari. 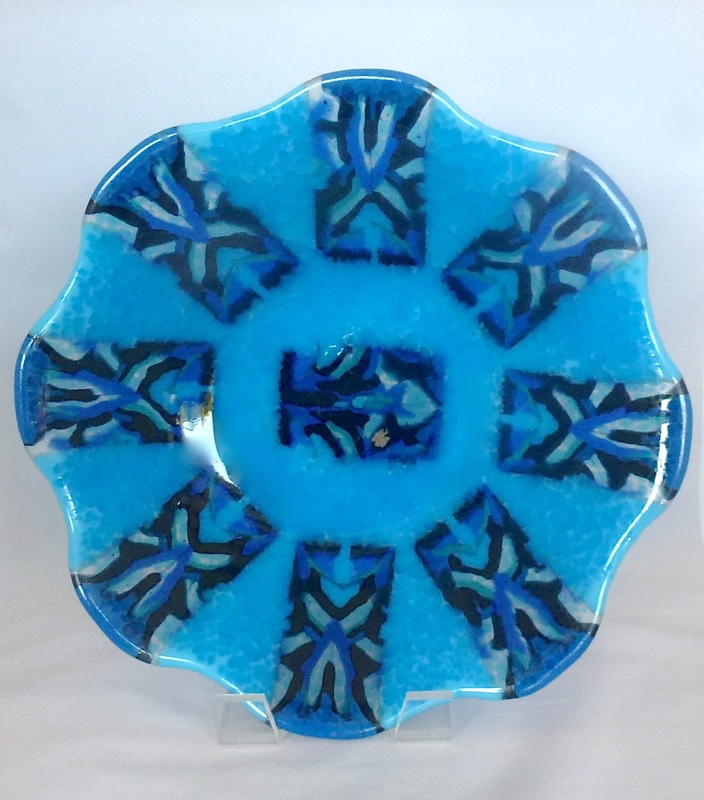 The blue butterfly bowl is a one of a kind piece created by Sandra Lercari. 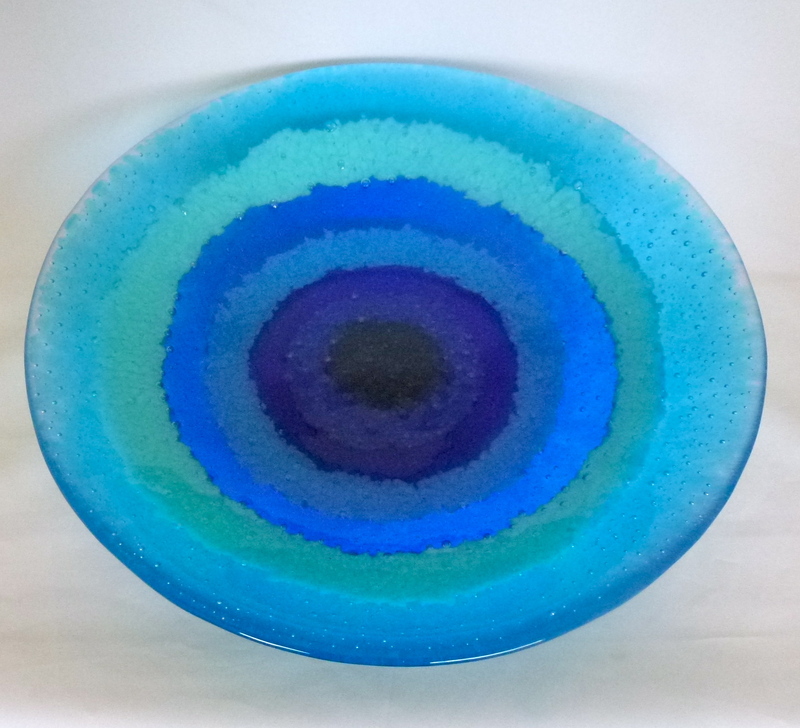 It was created using an overlay of glass frit in opaque blues on a transparent blue base. The approximate dimensions are 17 inches round. The spiral rainbow bowl was created by Bob Lercari. It is part of his rainbow series. It was created using strips of transparent glass in the colors and sequence of the rainbow. The approximate dimensions are 15 inches round. The bowl was created by Sandra Lercari using pattern bars in purple. The piece has a 6 inch transparent neolavendar center surrounded by six pattern bar pairs separated by opaque neolavendar. The approximate dimension is 15 inches scalloped round. 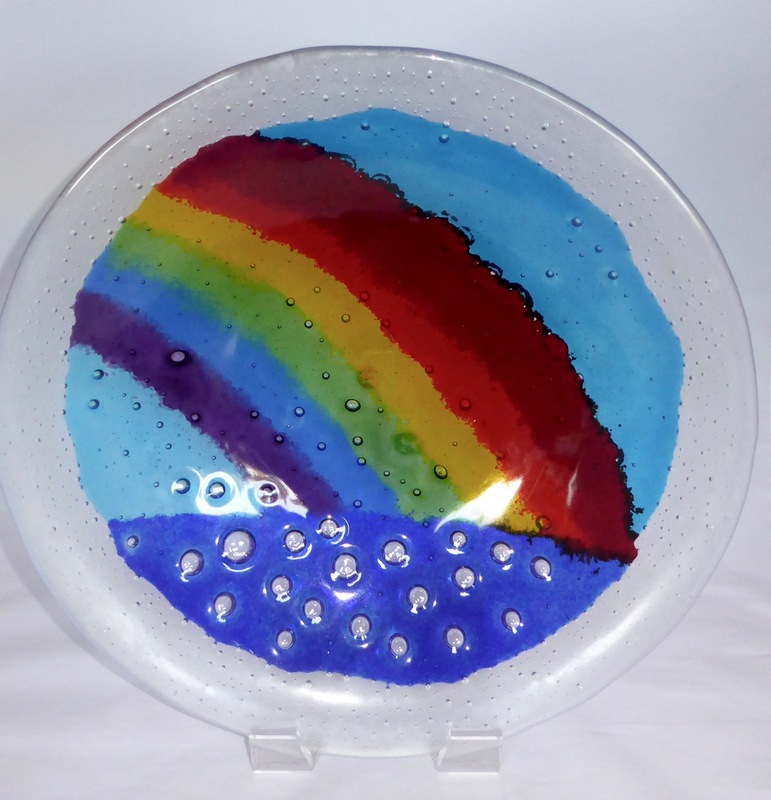 This rainbow bowl was created by Bob Lercari as part of his rainbow series. It was created using six triangular pattern bar slices of transparent glass in the colors and sequence of the rainbow. The approximate dimension is 15 inches round. The scallop shell shaped bowl was created by Bob Lercari. 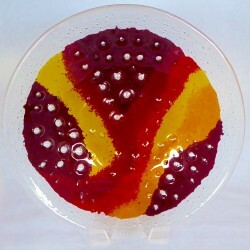 It was created using pattern bar pieces in reds, yellows, and blues on clear glass. The approximate dimension is 16 inches. The Star Burst bowl was created by Bob Lercari. It was created using pieces of pattern bar in a pentagon arrangement. The approximate dimensions is 16 inches round. 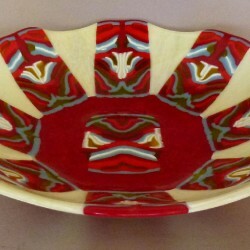 This bowl was created by Sandra Lercari. 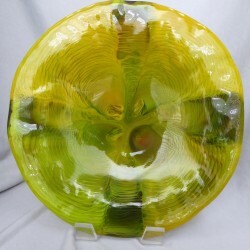 It was created using pieces of a pattern bar developed using adventurine green and transparent marigold yellow glass rods.The piece underwent many firings to finally achieve the desired finish. The approximate dimensions is 15 inches round. 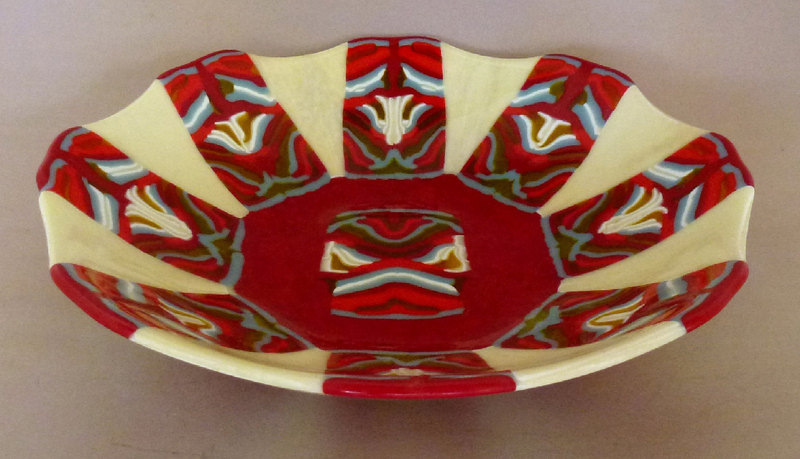 This pattern bar bowl was created by Sandra Lercari. It was created using pieces of a pattern bar in blues. The piece underwent multiple firings to achieve the final result. The approximate dimensions is 16 inches round. 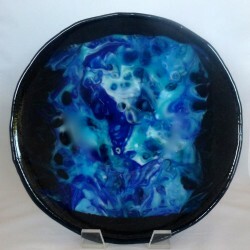 The Screen Drop in Blues bowl was created by Sandra Lercari. It was created from pieces of a broken pattern bar bowl using a steel screen grid. 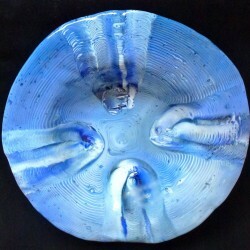 The outer edge of the piece was crated using adventurine blue frit.The approximate dimensions is 16 inches round. 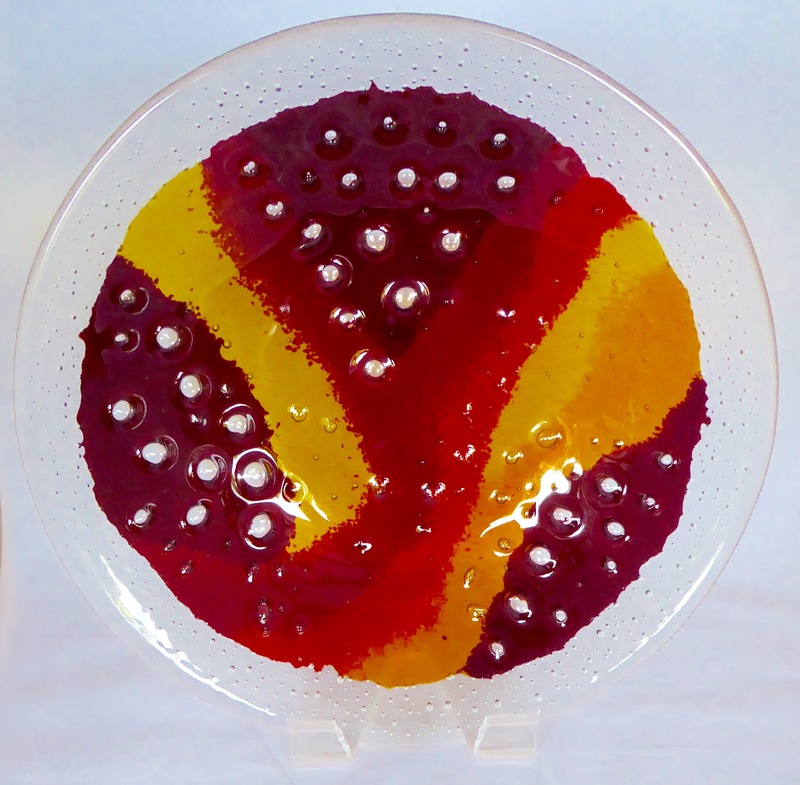 The Mandala bowl was created by Sandra Lercari. 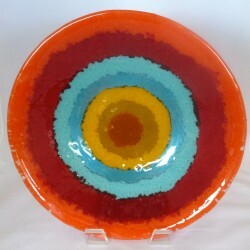 It was created using alternating rings of opaque and transparent frit going from orange on the outer rings to turquoise to marigold yellow. The approximate dimensions is 15 inches round. This drop pot bowl was created by Bob Lercari. It was created using deep cobalt blue, yellow, and spring green. The approximate dimensions is 16 inches round. 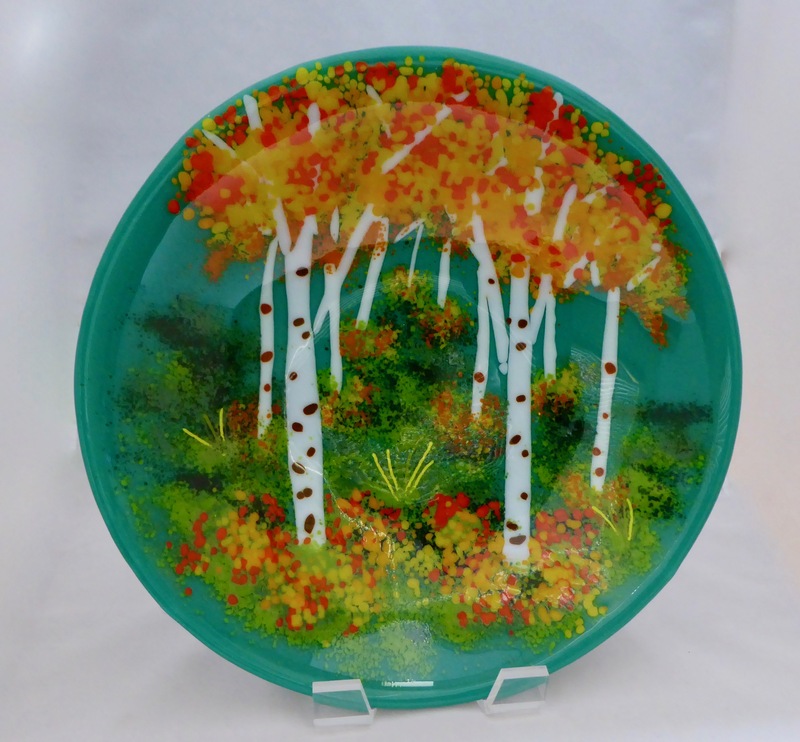 This 16 inch drop pot was created by artist Sandra Lercari. It combined oranges, reds and blues. 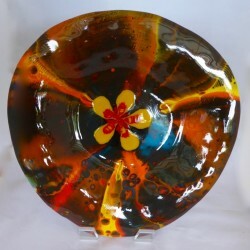 A marigold yellow plumeria was fused into the center of the piece. Fifteen inch bubble bowl by artist Sandy Lercari. Created using transparent reds, orange, and yellow. 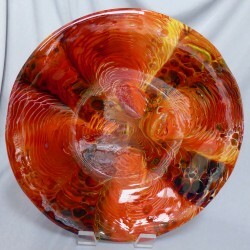 Sixteen inch bubble bowl by glass artist Sandy Lercari. Transparent rainbow colors rise from the true blue sea in a bubble motif. 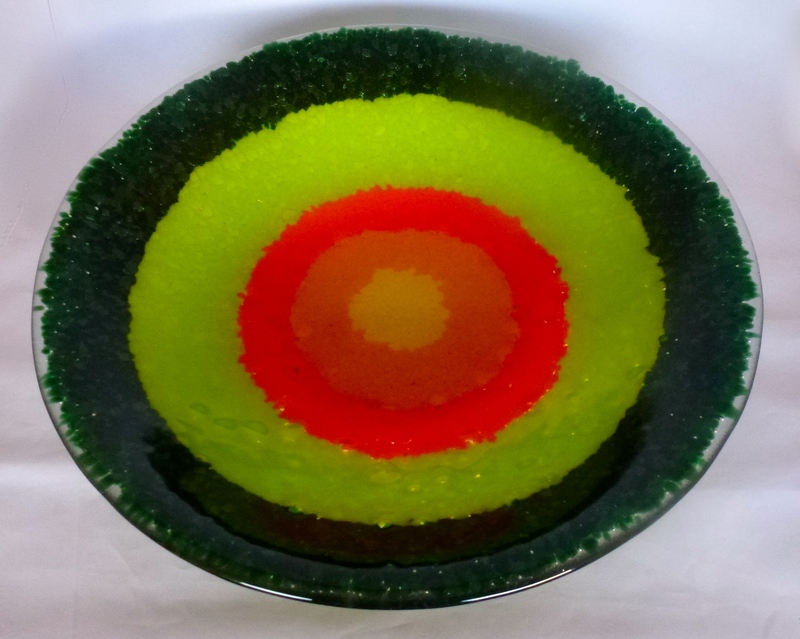 This 15 bowl is made with hand cut glass and frit (glass chips) fused on top of 2 layers of glass. 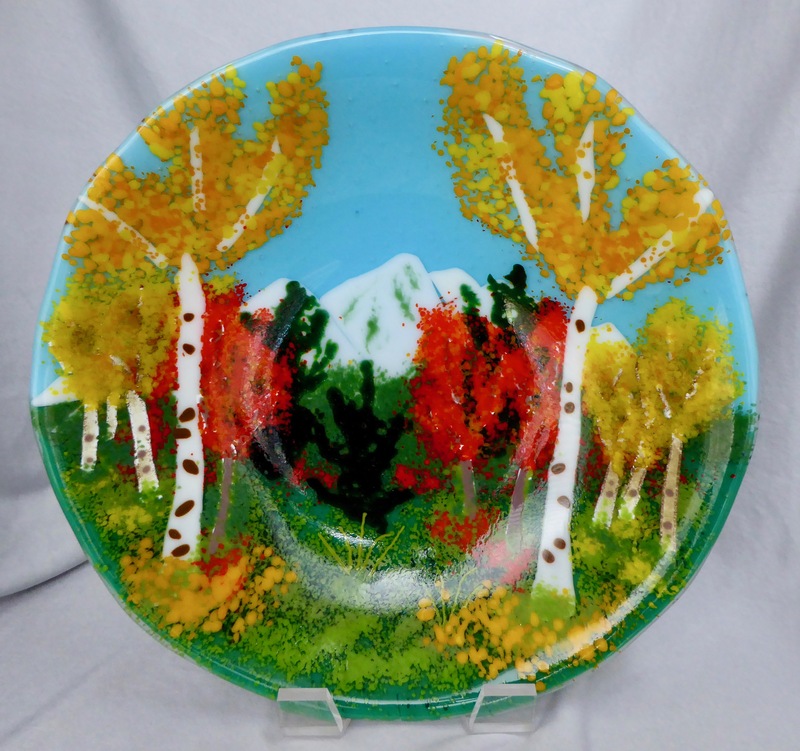 The Birch in Fall design is created and signed by artist Bob Lercari. Screen drop of yellows and orange on indigo and deep cobalt created by Bob Lercari. 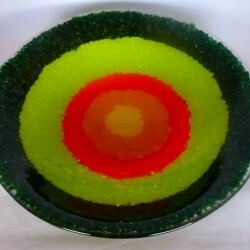 This 15 bowl is made with frit (chips of glass) fused on top of 2 layers of glass. The design was created by artist Sandra Lercari. 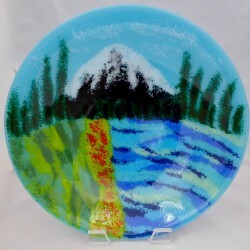 It depicts the key features of Central Oregon landscape in spring... fast moving streams, fields with wild flowers, tall pine trees, and the Cascades with lingering snow. 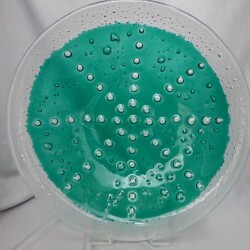 This 16 inch bubble bowl is made with transparent Kelly green glass. It is a one of a kind signed piece by artist Sandra Lercari. 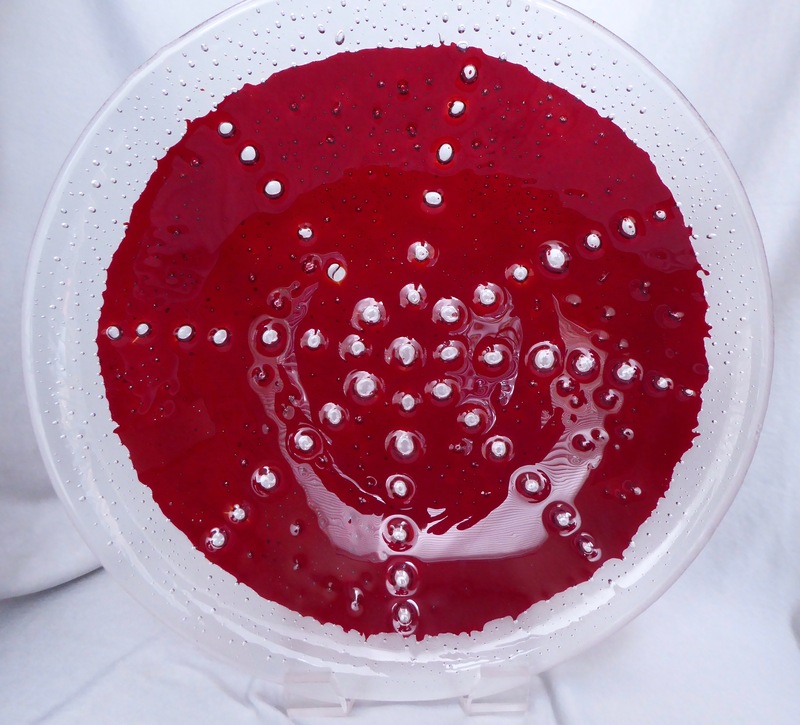 This 16 inch bubble bowl is made with transparent Garnet red glass. It is a one of a kind signed piece by artist Sandra Lercari. 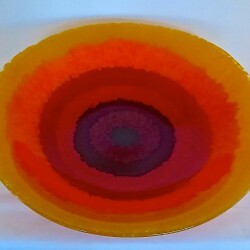 This 16 inch drop pot bowl is made with opaque orange and red glass. It is a one of a kind signed piece by artist Sandra Lercari. 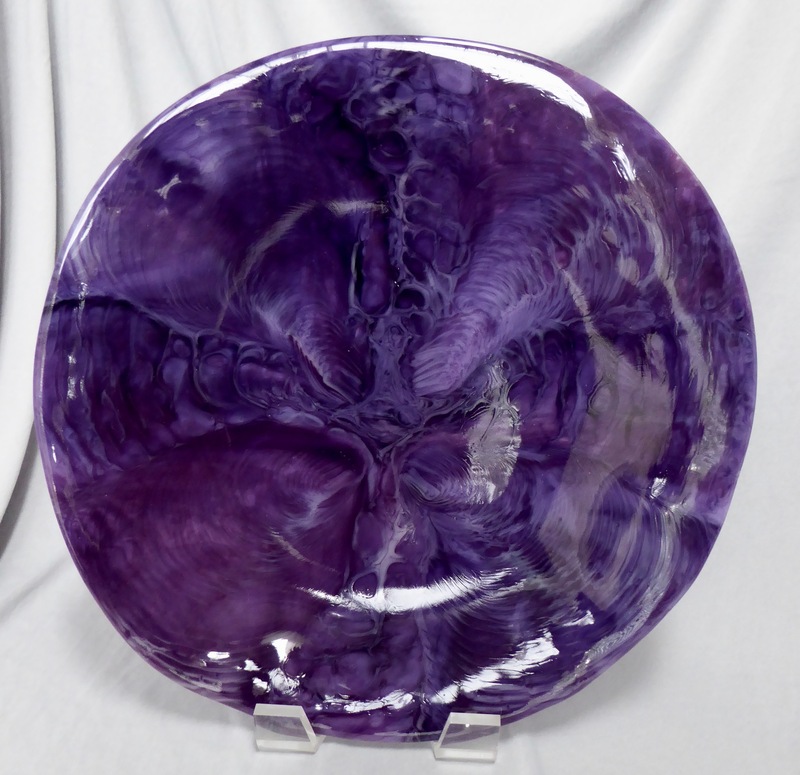 This 16 inch drop pot bowl is made with opaque and transparent purple glass. 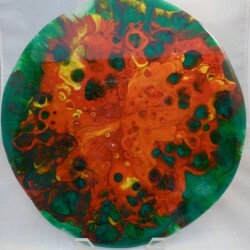 It is somewhat translucent and is a one of a kind signed piece by artist Sandra Lercari. This 16 inch drop pot bowl is made with opaque yellows and grey glass. It is a one of a kind signed piece by artist Sandra Lercari. This 15 inch drop pot bowl is made with opaque spring green and yellow glass. It is a one of a kind signed piece by artist Bob Lercari. 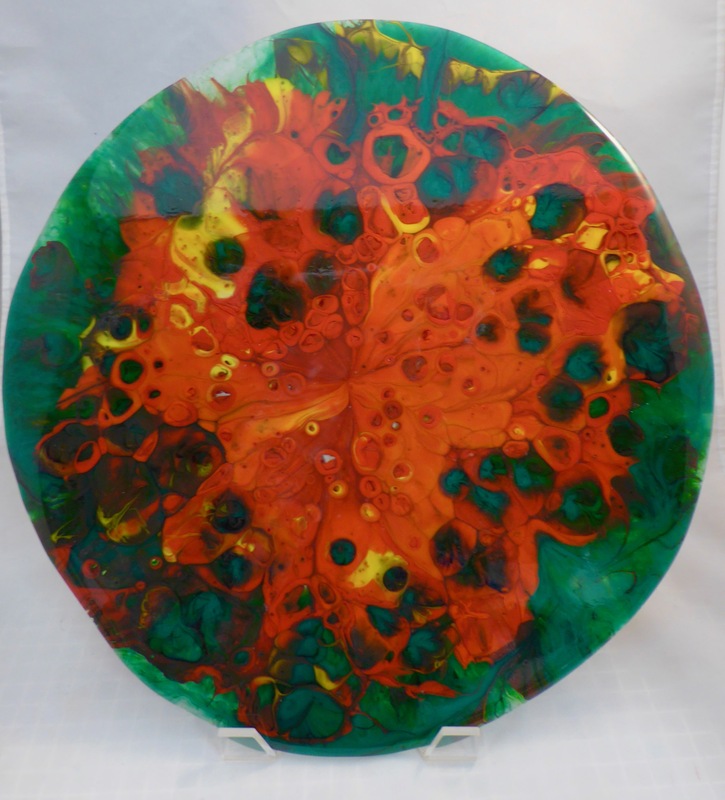 This 16 inch screen drop bowl is made with opaque orange and red, together with teal and green glass. It is a one of a kind signed piece by artist Bob Lercari. 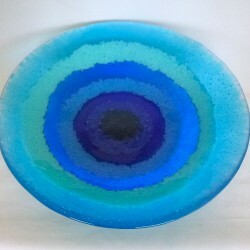 This 16 inch mosaic bowl is made with opaque glass strips and frit. It is a one of a kind signed piece by artist Bob Lercari. Rectangular platter 12x14 inches. Pattern bars in yellow, moss green, and sky blue on a moss green frit back ground. This is a one of a kind signed piece by artist Sandra Lercari. 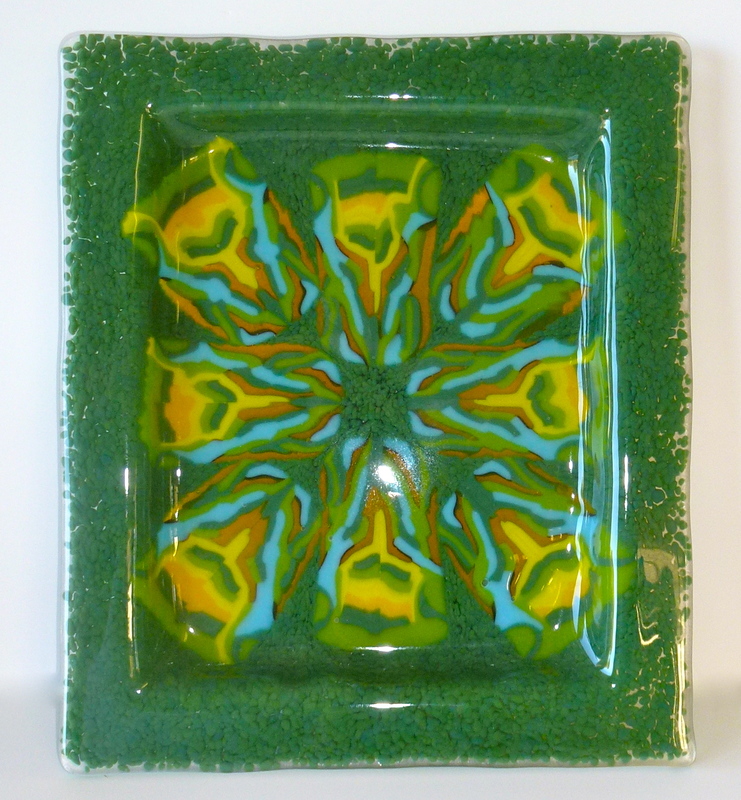 This 10x12 inch platter was developed around pattern bars with blues and green. 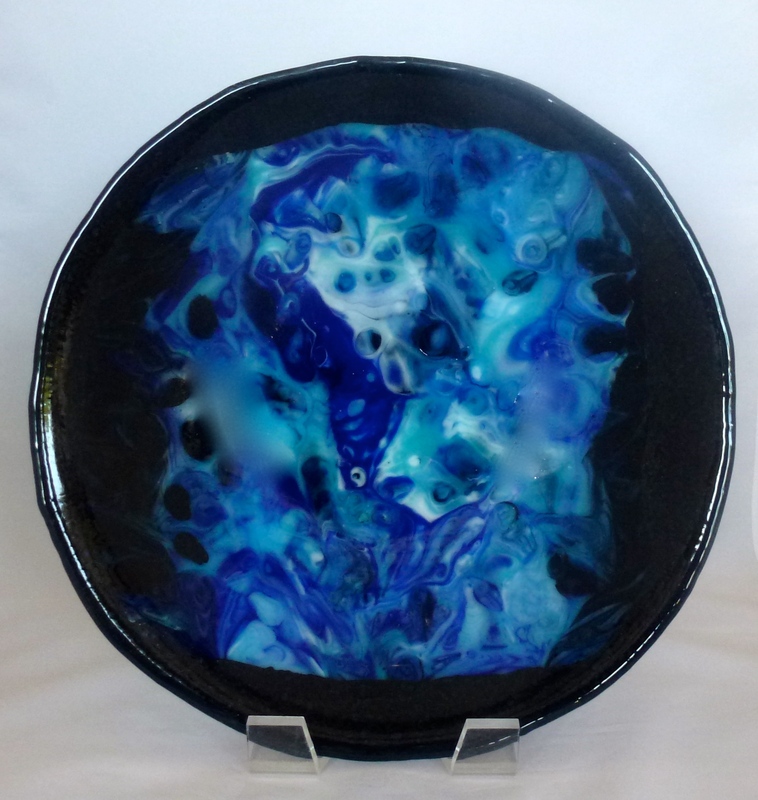 The piece is bordered using electric blue frit. This is a one of a kind signed piece by artist Sandra Lercari. 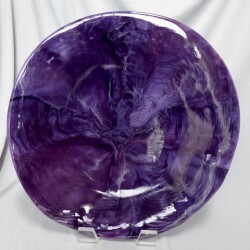 This is a 13 by 13 inch platter created using pattern bars directly fused together. The pattern bars come from two separate "loaves" in which the same color combination was used. This is a one of a find signed piece by artist Sandra Lercari. 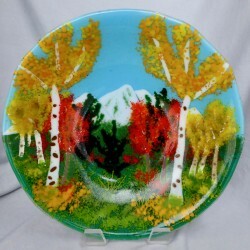 This 17 inch platter was created and signed by artist Sandra Lercari based on a floral painting of hers. 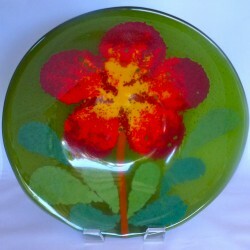 Leaves and the flower were first created by fusing frit. These pre-fused pieces were then placed over hand cut pieces on a base layer and fused to form the design. 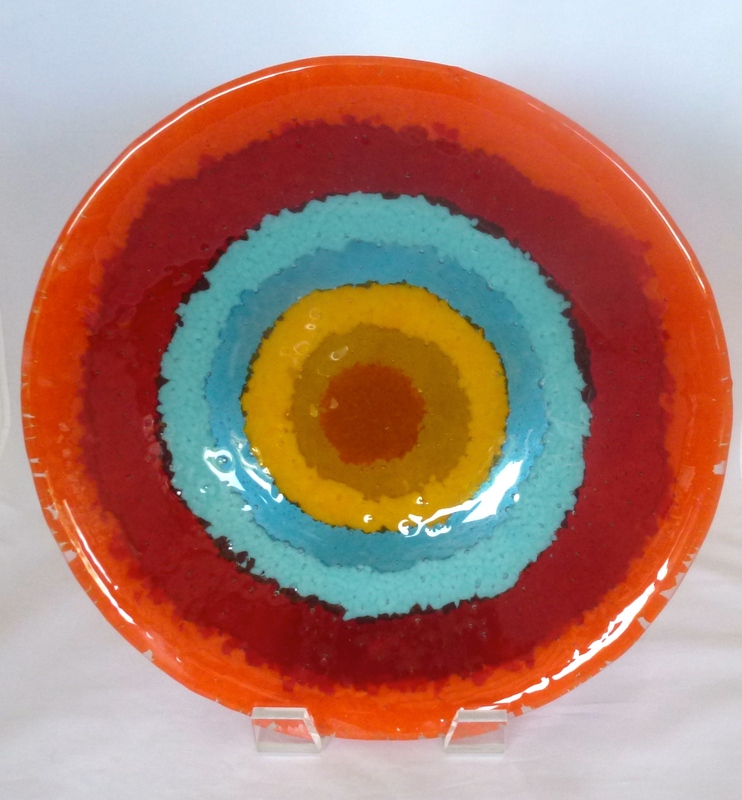 This 19 by 24 inch drop pot platter is made with yellows, orange and red glass. The oval shape was created using two drop pot closely spaced so that their molten glass combined to form a single piece. It is organic in design and is a one of a kind signed piece by artist Bob Lercari. 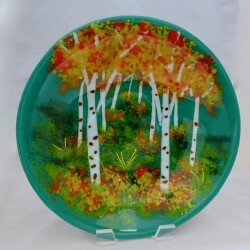 Bowls and Platters have been the primary Functional Glass Art pieces that we have created. They cover a wide range of sizes and shapes. We have developed pieces that are circular, oval, rectangular, square and octagon. Sizes range from 5 inches to 18 inches. 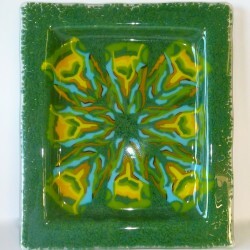 Glass fusion techniques include Drop Pot, Pattern Bars, Bubble, and Mosaic. Drop Pot pieces are very organic looking with serendipitous swirls. Each bowl is totally unique and un-reproducible. Examples are shown in the photos at the left. Retail prices range from $250 for a 12 inch bowl to $550 for a 17 inch bowl. However, these are currently being offered at wholesale and below prices. 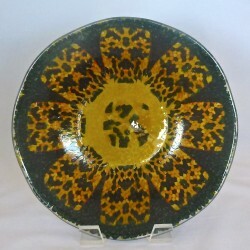 Pattern Bar bowls and platters are unique in that only one bowl or platter is made from a pattern bar “loaf”. 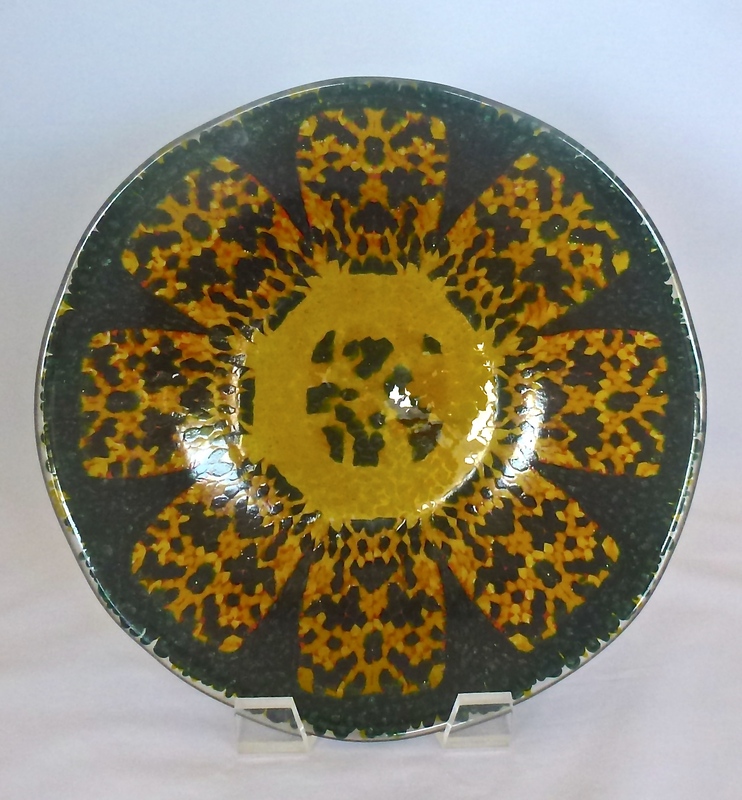 Examples of a pattern bar bowl and a pattern bar platter are shown in the photos at the left. Retail prices range from $325 for 12 inch pieces to $600 for 16 inch pieces. However, these also are currently being offered at wholesale and below prices. 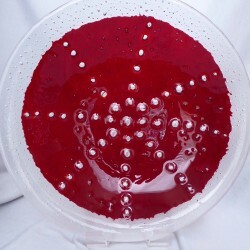 Bubble bowls are created using a technique we developed to capture purposefully placed bubbles in the glass. This is the newest technique that we developed with a couple of examples shown at the left. These can be done in any shape. Retail prices range from $200 for 12 inch bowls to $400 for 16 inch bowls . As with other pieces, these also are currently being offered at wholesale and below prices. 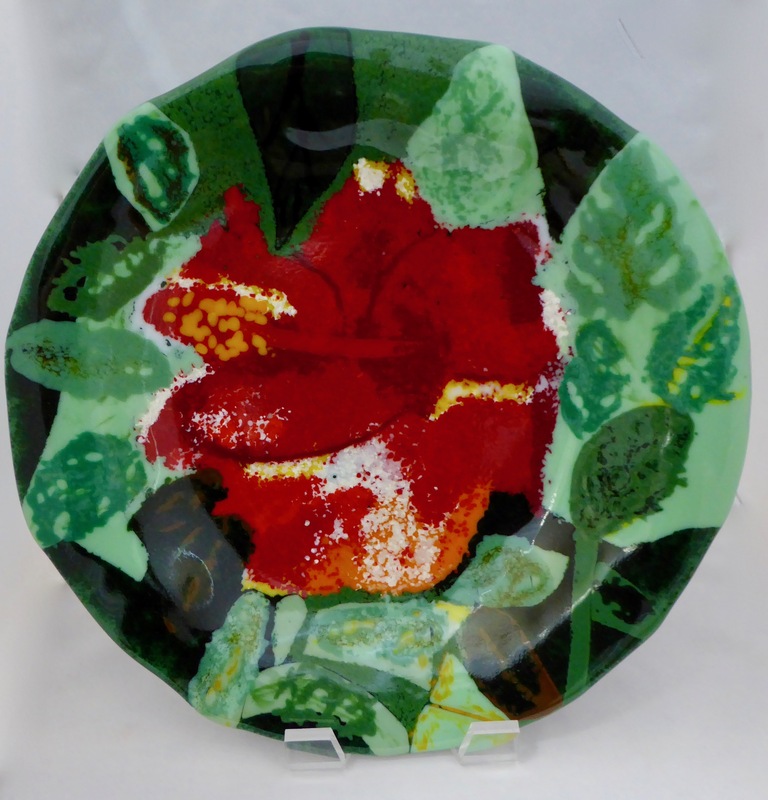 The last technique is Mosaic in which individually cut pieces of glass are used to create the design and are fused together in our kiln. Designs vary from florals to sea-inspired, as well as abstract and geometrics. These can be done in any shape. Retail prices range from $40 for 6 inch dishes to $500 for large (18 inch) platters. Again, these are currently being offered at wholesale and below prices.